I love food that is made with care and attention and I am a fan of the potato, I love the nuances of flavour and texture. 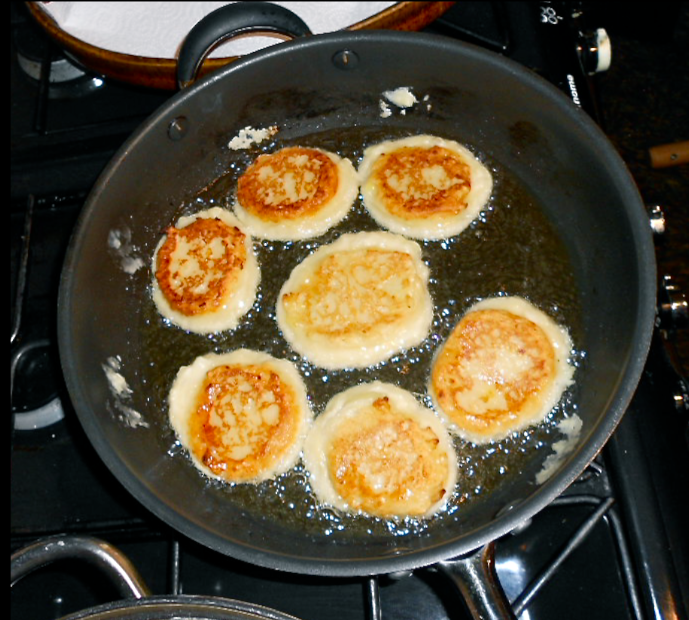 For me Potato Cakes are all about the potato. I don’t add anything to them to perk up the flavour as what I want is the flavour of the potato to shine through. These are something that I make maybe twice or three times are year, everyone loves them and there is an almost stunned silence once they are actually tasted. Did you ever have this experience as a child? Your Mum has got some new potatoes (my family were peasant farmers from the south of Italy so our potatoes came from the back garden damply, dirty and sweet smelling, a quick rinse under the cold tap and straight into the pan). We were little and we just never had snacky things around, so when it came to meal times we were hungry. Mum would squat down with the pan of potatoes on a chair and with her skilled, heat resistant fingers she would peel the skin from the scalding potatoes, break them in two, blow on them and share the pieces between me, my big brother and my little sister. That flavour of potato fresh and unadulterated has a simplicity that is rare. 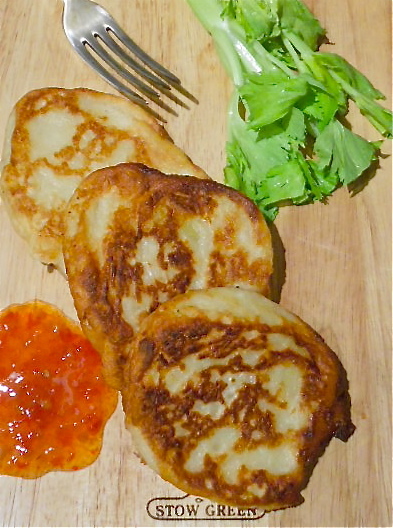 These potato cakes are all about the potato. I prefer waxy- you may prefer floury- try them, learn which potato is the one YOU like mashed, or roasted – you don’t need to be told, go cook, eat, share, enjoy! 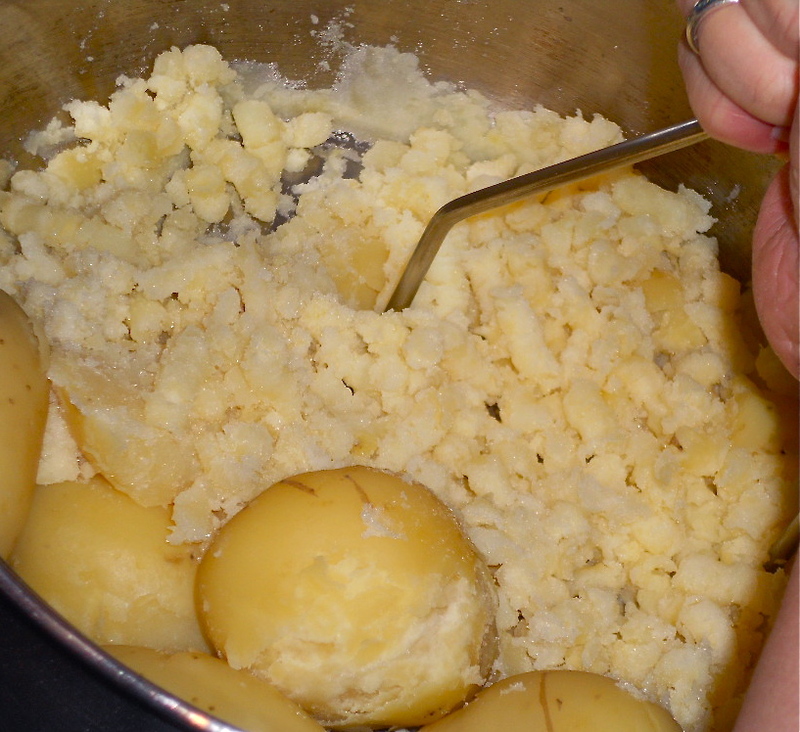 Boil the potatoes in a pan of salted water for 15–20 minutes until soft. Drain then and cover in cold water for about 30 -40 seconds, this will make them just cool enough to handle (not any longer as they will become wet inside). Now begins the apprenticeship in ‘asbestos fingers’. 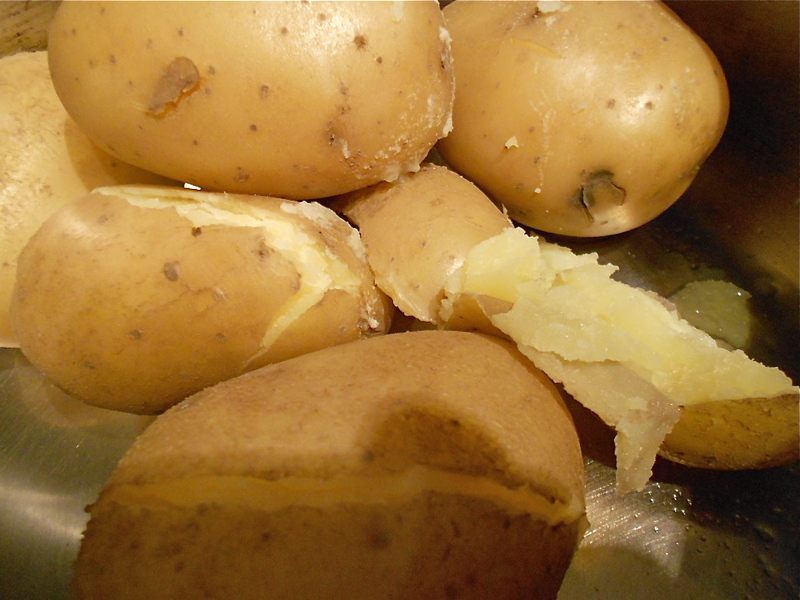 Quickly peel the skin away and discard and put the potatoes back into the pan. Mash them as normal don’t worry if there is an occasional larger piece, they will taste great in the final cake. Allow them to cool for 5 minutes. 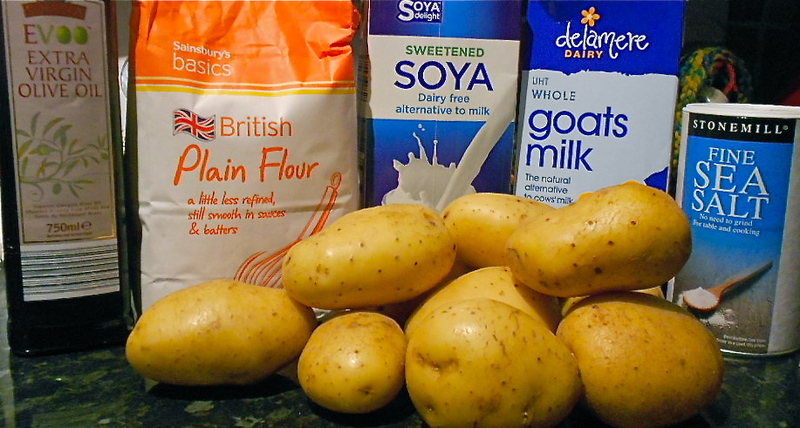 Mix the flour and potatoes and start adding in the liquid. It needs to have a consistency like a firm cake batter (this quality is dependent on the potatoes you use) It needs to be able to hold it’s shape without being so hard that it cannot expand a little as it cooks. Heat the olive oil in a heavy based frying pan over a medium heat. Now I like to use an ice cream scoop but you can use a couple of dessert spoons to make up the cakes, add them straight into the hot oil as you scoop. It should take 2-3 minutes to brown to a nice golden colour, any faster and you need to turn the heat down, otherwise they won’t be cooked through. Any longer and they will just absorb all the oil and be heavy and greasy – so turn the heat up a tad. Turn them and press them down so they make a sort of skirt of collar around themselves (so they are 1.5 – 2 cm thick). As they cook pop them onto a warm plate with kitchen roll on to absorb the excess oil. 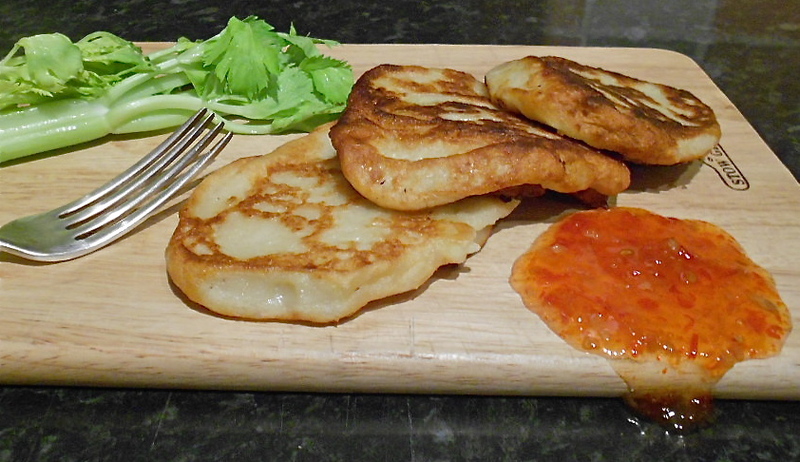 These can be served as an accompaniment to other food but we tend to eat them on their own with some boiled cabbage or white beans and red onion stew, they are very nice with some Sweet Chilli sauce too. This entry was posted in Dairy Free, Dinner, Egg Free, food, Lunch, Side dish, Summer, Supper, Tea/Snack, Uncategorized, Vegan, Vegetarian, Winter. Bookmark the permalink. I love me some potatoes! And I agree, the focus here should definitely be the potatoes. I could eat a ton of these. This post brought back memories of my childhood. My mom made these and I enjoyed them tremendously. It was hard to stop eating them! Thanks for visiting blog and for the like! Lots of enticing recipes on this site. I will be busy baking!